Huckleberry Ripple is the most popular flavor at Ferdinand's (top); at the Coug (bottom), visitors are invited to write on the wall. Cozy and divey and just off campus, the Cougar Cottage serves as the first stop for after-class drinks for students as well as a home away from home for Washington State University alumni. Friends huddle on bar stools for beer and burgers while "Brown-eyed Girl" plays over the stereo. Scribbles and signatures cover the walls behind them, thousands of them from floor to ceiling, marking multiple generations in Sharpie. Employee Lance Lijewski says the bar rotates through repainting some sections, but also preserves some doodles going back decades. "There are some that date back to the '90s," he says. "We try to keep as much as we can." Readers declared Cougar Cottage, more often called simply THE COUG, the Best Bar on the Palouse this year. Lijewski says the bar values tradition and invites people to be a part of its story. In addition to the graffiti, the bar also sells permanent personalized bricks for its outdoor patio. With a diverse stable of regional beers, he says, the Coug also tries to offer elevated pub food composed of fresh and quality ingredients. "We are very much a beer bar," he says. "[But] we want the quality of the food to reflect the quality of the experience." Across campus, a gaggle of children crowd the glass counter at FERDINAND'S ICE CREAM SHOPPE for the Best Ice Cream on the Palouse. 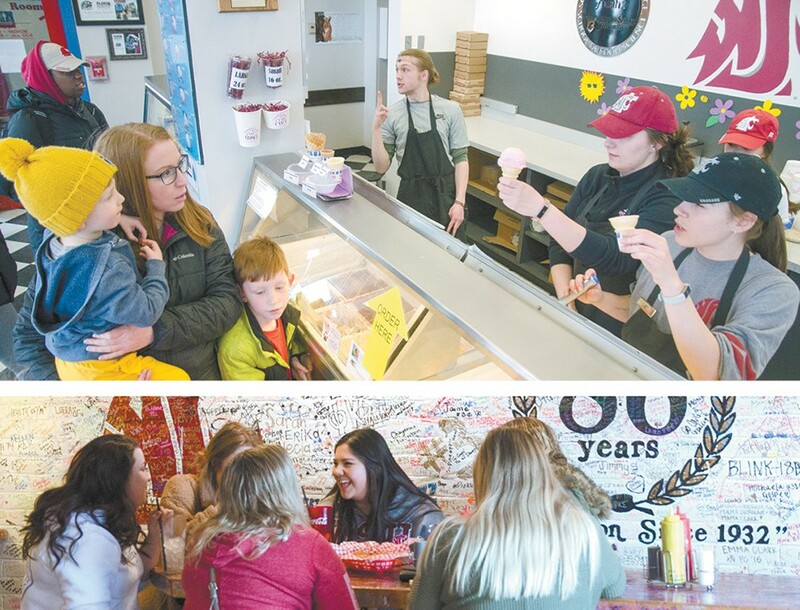 Kids scramble for scoops of Cougar Tracks, Apple Cup Crisp ice cream or the shop's most popular flavor — Huckleberry Ripple. WSU Creamery Manager John Haugen says it gets its milk straight from the university dairy and makes everything on site. They produce about 22,000 gallons of ice cream a year. "We're not cutting corners on anything," he says. THE DAILY GRIND in downtown Pullman won reader support for the Best Coffee Shop on the Palouse with its homey mix of open space, plush chairs and exposed brick decor. Owner Tami Grady says the coffeehouse tries to give students far from home a place they can feel comfortable. "It's gives them a safe place," she says. "There's something here for everyone." Since taking over seven years ago, Grady says she has worked to establish a welcoming culture and quality coffee. They serve a unique, handcrafted blend. They have also expanded the menu to include vegan, dairy-free and other healthy snacks. "We're not a big corporation," she says. "We put in a lot of care. ... You just surround yourself with great people." Whether its a first date or a retirement party, the SOUTH FORK PUBLIC HOUSE prides itself on having an atmosphere that fits the occasion. Readers again voted South Fork the Best Restaurant on the Palouse. Manager Sam Reebs says they offer 24 regional beers and ciders, an upscale menu and ever-changing specials. "We try to make sure that we cater to everyone," he says. Over the Idaho stateline in Moscow, LA CASA LOPEZ takes top honors for Best Tacos on the Palouse. The restaurant and cantina, located along Main Street, has served traditional Mexican cuisine since 1994. Diners can enjoy fajitas, chimichangas, vegetarian dishes and, of course, plenty of tacos. The Palouse comes together in late summer to celebrate the region's agricultural heritage and welcome WSU freshmen with the NATIONAL LENTIL FESTIVAL, this year's Best Community Event. Director Britnee Christen says this year will mark the 31st annual festival. "We always try to keep it fresh," she says. More than 400 volunteers come together to provide free live music, carnival games, a beer garden, food vendors and a 350-gallon vat of lentil chili. Christen notes the festival has rescued thousands of pounds of unserved chili in recent years to distribute to local families in need. When Christen looks around the festival, she enjoys seeing families playing, students exploring their new community and longtime volunteers pitching in to make sure everyone has a good time. "That is a sign for me that we did it right," she says. "We try to keep community at the forefront."